Sonorama / Prospekt | J. Ricardo Mejía S.
Sonorama, a new urban intervention. Sonorama, a new urban intervention – Client: Bogota D.C. Urban Department Design & Engineering (Prospekt design): Cedeno R. and Mejia J.R. Project date & place: 2003 Colombia Awards: Magazine of Architecture and Design +A and Cemex of Mexico Sonorama is a urban intervention artifact, that serves as a landmark in the city. 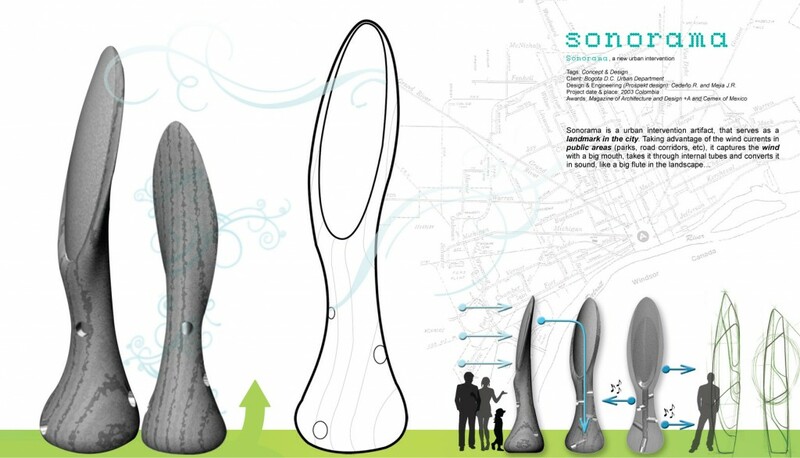 Taking advantage of the wind currents in public areas, it captures the wind with a big mouth, takes it through internal tubes and converts it in sound.